On June 12, 2016, Puff n Fluff Pet Spa participated in the Animal Rescue Fair at Wills Park Equestrian Center. The ARF is the largest pet adoption event in the southeastern US and we’re excited to have been able to give our support. Over 50 pet rescues and humane societies from Georgia and surrounding states converged at Wills Park along with a host of vendors offering good food, shopping, and puppy love. At our booth we were joined by DoggleHead who showed off their new concept in leash and collar designs. We also had a couple of raffles for gift baskets from Puff n Fluff Pet Spa and our friends at Bubba’s Pet Emporium. 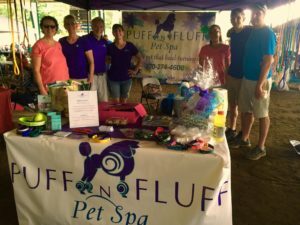 The Puff n Fluff Pet Spa raffle winner was Faith Berger, who won our gift basket full of fun doggie goodies and a gift certificate for her pup’s next spa day. Bubba’s Pet Emporium gift basket full of a sampling of their great products was won by Caroline Crawford. It was a great day filled with fun and lots of pet adoptions!